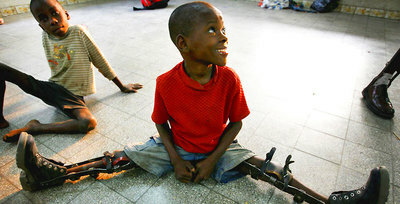 PHI has funds to assist with the purchase of bracing and custom-made or modified shoes. Please send an email to info@post-polio.org for an application. Please apply before you purchase. PHI will review the application, call the applicant and the company. 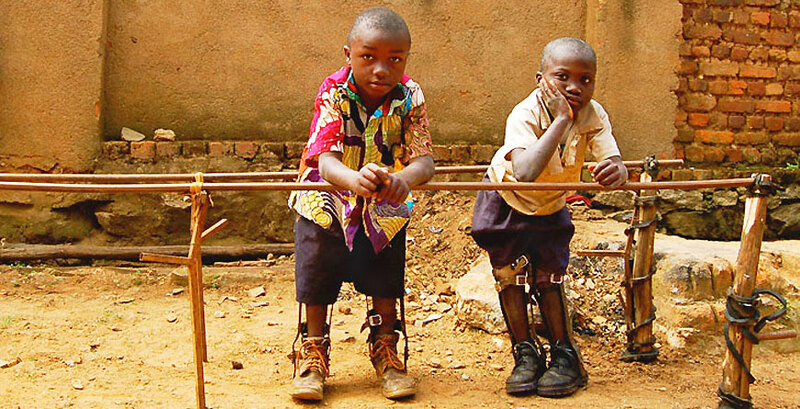 If approved, PHI sends funds directly to the brace (or) shoe maker. The Post-Polio Directory has been newly updated for 2019 and can be accessed online on both of our websites. On www.post-polio.org go to www.post-polio.org/net/pdirhm.html. Click on the image of the Directory to open. On Polio Place it can be found by clicking on the menu tab on the right or at www.polioplace.org/post-polio-directory. If you know of a doctor that you would like to nominate for inclusion in the directory or if you attend a support group that is not listed, send us a message at info@post-polio.org. Likewise, IVUN’s Resource Directory for Ventilator-Assisted Living has also been updated for 2019 and can be accessed from the home page of IVUN’s website, www.ventnews.org. A polio survivor recently donated to PHI several pairs of women’s athletic and dress shoes. The shoes come in sizes 5½ and 6 with a 2” lift on the left shoe. If interested, contact us at info@post-polio.org. It will be held on Saturday, May 4th in Atlanta. Registration is required. A new study concerning acute flaccid myelitis (AFM) and polio is being conducted by researchers at Johns Hopkins. They are currently recruiting polio survivors to participate in the study. 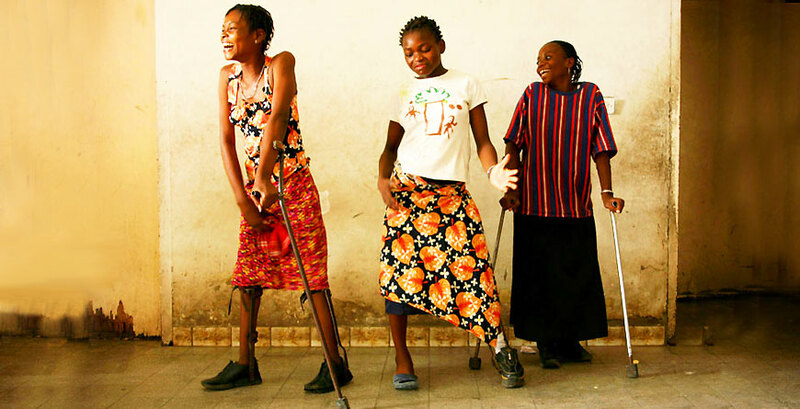 Polio survivors are encouraged to participate. You will be asked to fill-out a questionnaire and submit a saliva sample by mail. A new poll shows many older adults, especially those with health issues, feel isolated. The newfindings come from the National Poll on Healthy Aging, conducted by the University of Michigan Institute for Healthcare Policy and Innovation, and sponsored by AARP and Michigan Medicine, U-M’s academic medical center. Poll director Preeti Malani, MD, who has training in caring for older adults, notes that a growing body of research points to strong connections between health and loneliness – and to positive effects on health from increased social contact through volunteering, taking part in religious or community groups, and other activities. Are you or someone you know feeling lonely or isolated? The AARP has launched a program, Connect2Affect, that can help older Americans connect to others in their communities. Players from the 1969-70 University of Illinois wheelchair basketball national championship team were honored recently before the start of this year’s national championship game held at the State Farm Center on campus. Champaign’s News-Gazette interviewed two polio survivors, Kim Pollock and Richard Feltes, about their memories of playing for that team. And check out the next generation following in their footsteps. Birmingham’s WVTM featured a story on a young girl who originally contracted polio in China and is now pursuing her wheelchair basketball dreams. ​Another excellent piece on polio survivor Paul Alexander. ​that lives in an iron lung. ​The main objective of Rare Disease Day is to raise awareness amongst the general public and decision-makers about rare diseases and their impact on patients' lives. • Use a wheelchair (manual or power) at least 75% of your mobility time inside your home and 100% of the time outside your home. • Has a computer with internet access. It will take you up to about 20 minutes to complete it. People who complete the survey will be eligible for a drawing for a $20 gift card.You may contact Carolyn Da Silva, PT, DSc at cdasilva@twu.edu or 713-794-2087 for more information or questions. She is a professor in the School of Physical Therapy at Texas Woman's University and physical therapist at the post-polio out-patient clinic at TIRR Memorial Hermann Rehabilitation and Research in Houston, Texas. the work Pennsylvania Polio Survivors Network is doing, our regular column from Drs. Machell and Olkin, and more! Do you have topics you would like us to explore in Post-Polio Health? Send your ideas to editor@post-polio.org. With a good portion of the country dealing with extreme temperatures this week, it might be a good idea to highlight some winter safety tips.Paraplegia News highlighted some of the problems that might arise regarding accessible parking and snow in an article entitled, “Snow Plow Problems.” The article lays out actions you can take in advance and how to deal with problems when they arise. You might also check out“Winter Safety Tips for People with Disabilities” from Easter seals. In the event of a major winter storm, you may find some useful resources on the CDC’s section for Disability and Health Emergency Preparedness. Phyllis Dolislager has published a 2nd edition of her book, Who Hit the Down Button? : Life with a Chronic Illness or Disabilty. The new edition contains an update to the Profiles section, which now includes profiles of Bruce Sachs, Dianne Dych-Sachs and Maureen Sinkule. A Pound of Kindness is a true story from the childhood of Dave Clark, the only professional baseball player to pitch from crutches, A National Hero of Sports winner, and an advocate for children with differing abilities. Having worked with Dave for a number of years through their Disability, Dream, and Do sports events, Doug J. Cornfield wrote A Pound of Kindness to share with children and parents alike the enduring power of a simple, thoughtful act. When I met recently with members of Post-Polio Canada, the topic on many people’s minds seemed to be how to deal with post-polio pain. While pain management can sometimes be a difficult issue to get a handle on, Healthy Aging RRTC has published a factsheet that might help give you a start. ​ The fact sheet, “How to Manage Disability-Related Pain as You Age,”discusses different types of pain, how to maintain a healthy lifestyle, seeking help, pain management, self-management, different types of treatment including medications and complementary therapies, and additional resources. The full library of factsheets is available from the project’s website. The Washington Post this summer published an article, “Amid the opioid crisis, some seriously ill people risk losing drugs they depend on,” that looked at how efforts to combat opioid abuse had affected those who rely on them for the management of chronic pain. The article focuses on Julie Anne Feinstein, a polio survivor and Oregon resident who relies on opioids to control her pain. The article takes a nuanced approach, giving voice to those who believe chronic pain sufferers are “collateral damage” in the effort to fight opioid abuse and those who believe that even those who use opioids for legitimate purposes should be wary of addiction and overdose and should look for alternatives. At PHI, we have heard from several people who have run into problems while attempting to refill their prescriptions for opioids, which they view as an important component of their pain management strategy. We have also heard from those who have resisted efforts by their doctors to prescribe opioids for treatment of their post-polio pain, citing the way the drugs make them feel and their fears of addiction. 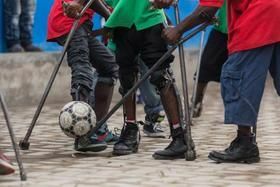 We recognize that managing chronic pain is a difficult endeavor and that polio survivors have complex medical needs that often defy a one-size-fits-all approach. We’d like to hear from you. What has been your experience? Send an email to info@post-polio.org or give us a call at 314-534-0475. The US Access Board marked the 50th anniversary of the Architectural Barriers Act (ABA) with a celebration on September 7th in Washington, DC. The event featured Judith Heumann, former PHI Board Member and Special Advisor for International Disability Rights at the Department of State, and other guest speakers. Video of the event can be viewed here. We here at PHI have recently been discussing how we can work more closely with and provide assistance to local support groups. Rather than guess at what support might be most valuable, we’d love to hear directly from you. Would it be helpful for PHI to ship materials (newsletters, pamphlets, etc.) to pass out at meetings? Perhaps we could create a virtual welcome packet you could distribute to new members with essential information about the late effects of polio? Could we make it easier to request articles to reprint? Another idea that has been under discussion here is carving out space in our newsletter for news items from local support groups. This may include notices about upcoming events, wellness retreats or conferences; a news item about a group member; or perhaps an initiative by your group to improve accessibility in your community. If you have an item you like to see publicized to the wider post-polio community, send it to editor@post-polio.org. Two Great New Reads . . .
A new memoir, To Play Again, tells the story of Rosenberger’s remarkable battle to retrain her body after contracting polio at age 21. Overcoming all medical, music industry and social doubt—her own fears and doubts notwithstanding — Rosenberger returned to the concert soloist circuit at age 30. During the last four decades she has established herself as a gifted, sensitive pianist and an inspirational teacher as a faculty member at the University of Southern California and in workshops held nationwide. Under the Delos label, Rosenberger has made over 30 records. Author Thomas Wilczewski has fought adversity in one form or another his entire life. Two months before his fifth birthday, he was stricken with polio and confined to an iron lung for more than a year. After nearly two years, Tom was released from the hospital in a wheelchair, and he began his lifelong struggle to regain the stamina and mobility taken by polio. An Abled Life is available for purchase atwww.anabledlife.com. UC San Diego to salvage the 'lost' audio recordings of polio vaccine pioneer Jonas Salk – UC San Diego has commissioned a company to digitize more than 170 hours of audio recordings that Jonas Salk made between 1949 and 1967. The recordings were made on an obsolete piece of technology called an audograph, which recorded the sound on thin vinyl discs that were roughly the weight of tin foil. There was concern previously that playing the discs could destroy them, and, thus, they haven’t been heard in over a half-century. The digitization is expected to begin this summer. ​Polio Place is an archive of all our past newsletter articles, as well as a collection of post-polio related research reports. We've added lots of articles from our most recent newsletters, have a look HERE if you haven't already! by Dr. William DeMayo, MD. Thank you Post-Polio Health International for sharing this article. Thank you PHI for publishing these three informative videos. A Statement from PHI's Director Brian Tiburzi about the movie "Breathe"
she moves from having been the Director of PHI in St. Louis into the wonderful new adventure of retirement. As she steps down, we are looking forward to working even more closely with their newly appointed Director Brian Tiburzi. Many of us have been fortunate to work with Brian through the years, and know what a marvelous job he will do. If it comes up in Spanish, "click" on that page for translation. 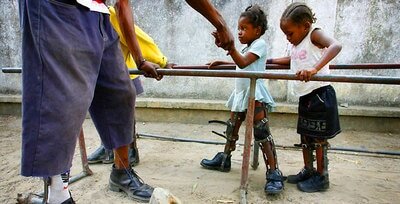 Post-Polio Health International has published more articles in Spanish. To find them, enter www.polioplace.org and write "Spanish" in the search box at the top right. ​1 in 6 older adults have been abused in the past year. Recognize the different forms of elder abuse. Reminder: While Facebook serves a purpose, it is probably not best to depend on it as your only source of post-polio information. ​Check to see HERE if there are resources near you/in your state/country. "The Pharmacy and Medical Museum of Texas, located in Cuero, Texas is looking for an Iron Lung that a family or organization might be willing to donate to our museum. We are interested in establishing a permanent exhibit on "The History of Polio." 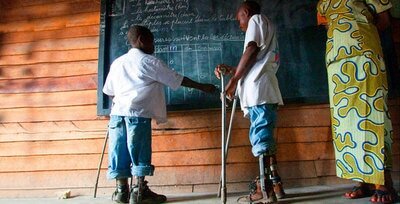 By providing free mobility-enhancing treatment and equipment, U.S., U.K., and Swiss charity StandProud improves the dignity and social integration of impoverished children and youth with motor disabilities in the Democratic Republic of Congo (DR Congo) . PAST and PRESENT LEADERSHIP of the National Council on Disability on H.R. 3765, the ADA Education and Reform Act: "No business should be given what essentially amounts to a pass to continue to violate a law that was established more than a quarter-century ago to end the pervasive discrimination against people with disabilities that prevented us from going to movies, eating in restaurants, shopping in stores, going to museums and sporting events, and simply being an active part of our communities." An Outstanding Radio Interview about Polio and PPS with Burk Jubelt, MD. Recently we posted an article and scans of the questions asked and the data results from the National Health Interview Survey (1987) from the National Center for Health Statistics regarding polio survivors. Go to http://www.polioplace.org/…/collecti…/selected-materials-phi and scroll down to National Health Interview Survey 1987 (the articles/booklets are in chronological order) to see the 15 tables, etc. The story of Lauro Halstead, MD. ​PHI periodically receives messages from polio survivors who have found a solution for their particular medical problem. Many are disappointed that we do not “tell everyone.” Why don’t we? Some of the solutions are part of a pyramid marketing scheme. Some solutions sent to us are unique to the individual and not a solution that would apply to most polio survivors, ie, treatment for hypothyroidism. And then there are those that may be helpful, but often the person/company with the solution will not offer more explanatory and credible information for publication. However, polio survivor Mary Pat Toups and Stephen Tang worked together and we share their story with you. AUGUST 14-18, 2016 Colorado Post-Polio 2016 Retreat (one hour from Denver). Contact Nancy Hanson at nhanson@eastersealscolorado.org for a registration form. Knee Replacements - Are you a polio survivor who had knee replacement surgery in your leg that has muscular weakness and atrophy? "Neighbors and Dedicated Nurses Cared for Polio Patients Requiring Iron Lungs"
By providing free mobility-enhancing treatment and equipment, "StandProud" (a US, UK and Swiss Charity) improves the dignity and social integration of impoverished children and youth with motor disabilities in the Democratic Republic of Congo. StandProud was selected as one of the top three candidates for November's Reader's Choice feature issue in Bittersweet Monthly, an online magazine that shares stories of “good” from around the world. In order for StandProud to win, we need for people to vote. If StandProud is the finalist, Bittersweet Monthly will share the organization's amazing story in its magazine. 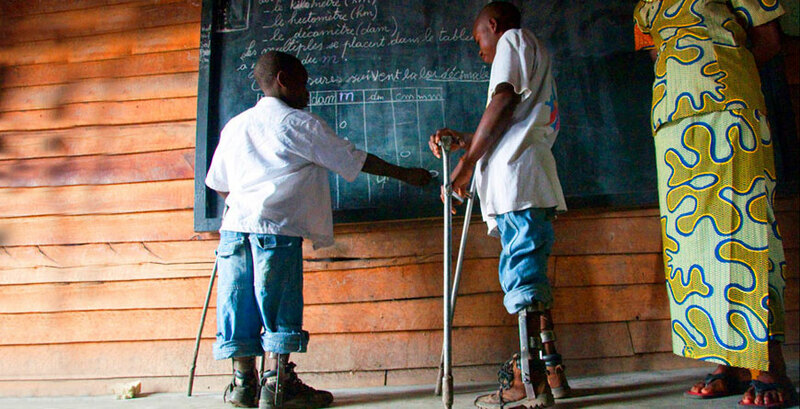 Help us spread the word about how Stand Proud provides mobility, dignity and integration to impoverished children and youth with motor disabilities in the Democratic Republic of the Congo. Visit www.standproud.org for more information on StandProud. "I contracted polio at age 11 (August, 1948) in New Jersey. After spending 11 miserable weeks in the Essex County Isolation Hospital, where the Sister Kenny treatments resulted in minimal to no improvement, my parents brought me home and I embarked on a series of physical therapy treatments, under the care of the late Dr. Philip Willner. Before each session, I was injected with Curare to relax my muscles. I was treated regularly for the next 2 to 2 1/2 years and I made substantial progress. Now I am wondering if there is anyone else out there who was given Curare prior to acute (post) polio treatments"
and we will connect you with the individual asking the question.